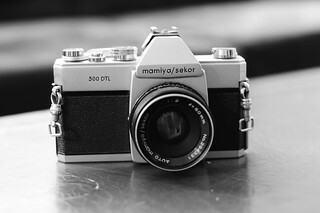 In the latter half of the 1960's, Mamiya sold a series of SLR cameras using the popular 42mm threaded lens mount. 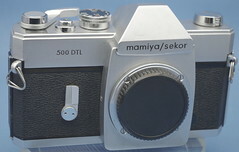 The TL models were introduced in 1966, the 500 and 1000 DTL in January 1968, and the 2000 DTL was introduced at Photokina 1968. These models may be grouped together, as they all share the same basic body; their differences are clearly reflected in their model designations. The numeral represents the highest shutter speed (1/500, 1/1000 or 1/2000 of a second); the letters TL or DTL signified Through the Lens or Dual Through the Lens light metering. The "500" models typically lack a self-timer. The later DTL dual-metering models introduced a switch beside the lens mount which allowed the photographer to select between an averaging meter pattern and a "spot" meter (actually a square area marked at the bottom of the viewfinder), with a viewfinder indication of the mode selected. This was a unique innovation for its day which was protected by U.S. Patent No. 3,612,703, filed February 29, 1968. Interestingly, the single metering mode offered by the TL models was the "spot" mode, not the averaging mode one might expect. 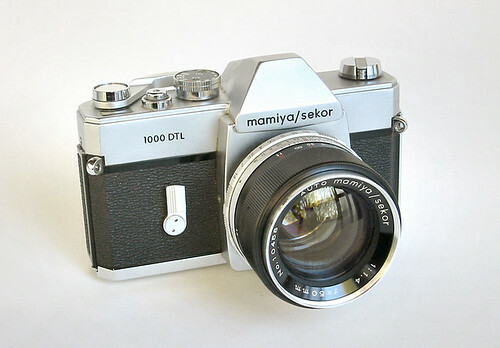 Thus it was the Mamiya TL and not Pentax who implemented the original meaning of Pentax's Spotmatic brand. As with other SLRs of the era, these cameras had no linkage between the light meter circuit and the f/stop selected; thus the lens needed to be stopped down to shooting aperture in order to take an accurate exposure reading. But it may be less than obvious at first glance how one is intended to activate the meter on a TL/DTL body. 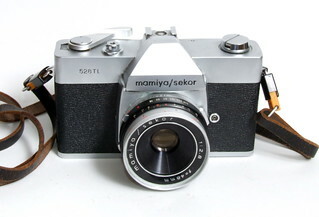 Mamiya made an interesting choice to have the film-wind lever also double as the stop-down lever and meter switch. The user pulls the lever away from the body until it clicks; after which, pressing the lever inwards against spring pressure stops down the lens and activates the meter circuit. To put the camera away without risking accidentally draining the single 1.5v silver-oxide meter battery, one stows the wind lever in its "off" position by clicking the round cap atop its axis. The switching mechanism is also unusual, instead of typical contacts the metal band around the battery is a loose fit until the wind lever is pushed inwards, at that point the band tightens around the battery to complete the circuit. Even by the SLR standards of their day, the TL and DTL models were at the large and heavy end of the spectrum. 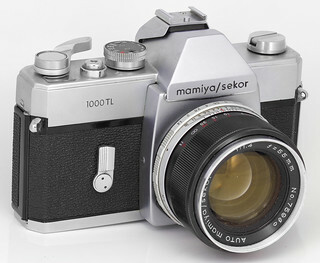 A 1000 DTL with its original 50mm f/1.4 lens weighs 1,077g (2 lb. 6 oz.) and measures 150 x 94 x 100 mm (W x H x D).